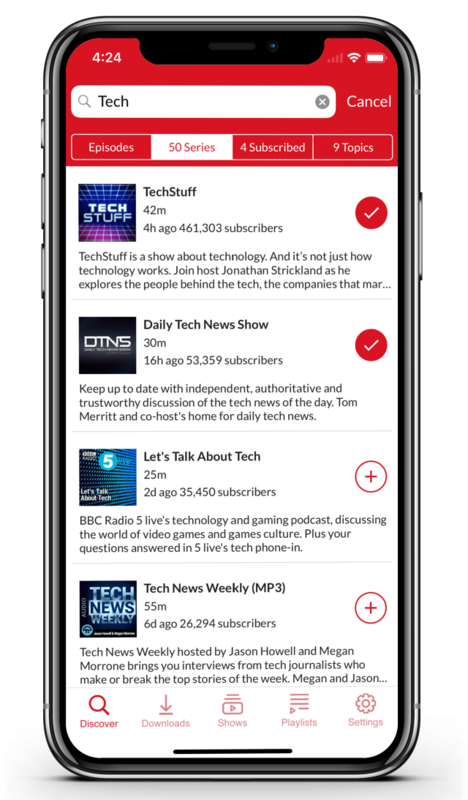 After months in beta, we’re excited to announce Player FM for iPhone is now live! We don’t do half-baked around here, so this is a very full-featured first release with all the bells and whistles you’ll be familiar with from other platforms. 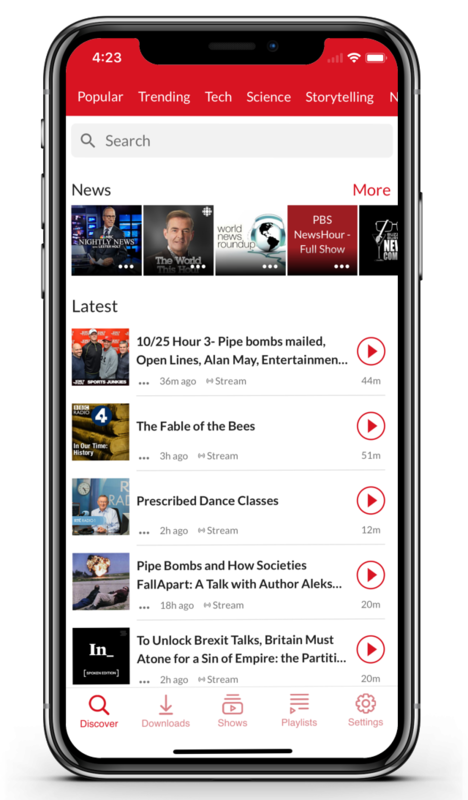 Your subscriptions and “Play Later” playlist will sync across iPhone, Android, and the web. Settings, catalogue, and search work the same way and are backed by the same source in Player FM’s servers. Premium users will also see full play history, play positions, and app settings sync between devices. iPhone has been a stop-start project for years now, but we made a dedicated commitment to getting it to production a year back and it’s seen ongoing work since then, while still updating Android and web at a steady pace. We’re grateful to all of you who tried the beta and gave us feedback throughout 2018 and now it’s really here. The app is public in most English-speaking countries and we’re finalising translation/localisation, so it will be expanded to other countries in the next few days, supporting 25 languages. Shows is where your subscriptions go – all your subscription categories and a combined “All” list. We’ve learned users love their subscriptions more than anything else, so it’s the default “home” for the app and the central icon on the bottom nav panel. 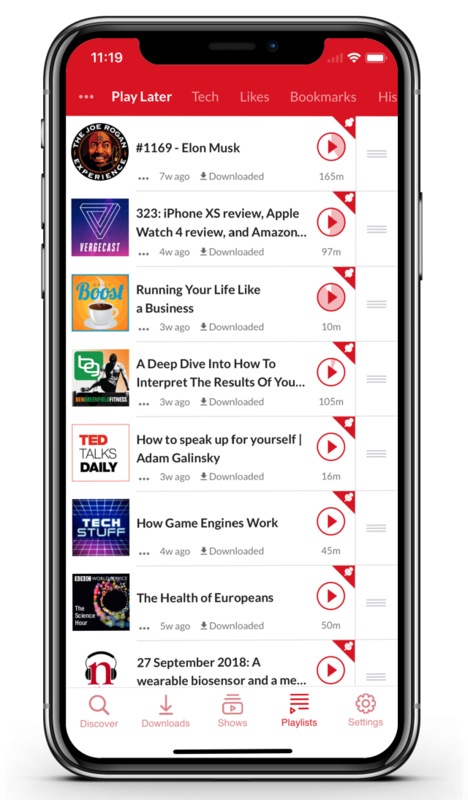 You can flip between series grid mode and a playlist-style episodes list, just by tapping again on the Shows tab (or from the “…” menu). 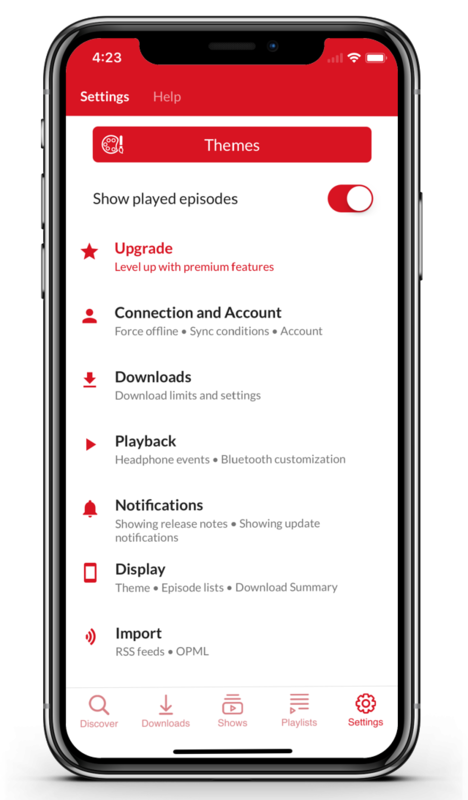 Playlists is where you’ll find your Play Later list – swipe any episode right to add it to your cloud-synced playlist and keep it offline. You’ll also find your Likes list here – tap the heart on any episode to keep it organized in your cloud-synced Likes list and share it with friends. And you’ll also find your play history here, should you want to resume a recent play. For premium users, Bookmarks appear here too, allowing you to annotate and save sections of shows. Premium users can also make custom, cloud-synced, playlists, and those will appear here too. Powerful discovery has been a goal for us since day 1 and with so much amazing content out there, the challenge is bigger than ever. In the Discover tab, you’ll find a stream of recommended series and episodes on your favorite topics. And of course, this is where you can search or browse our extensive catalogue, with over 500 human-curated topics. 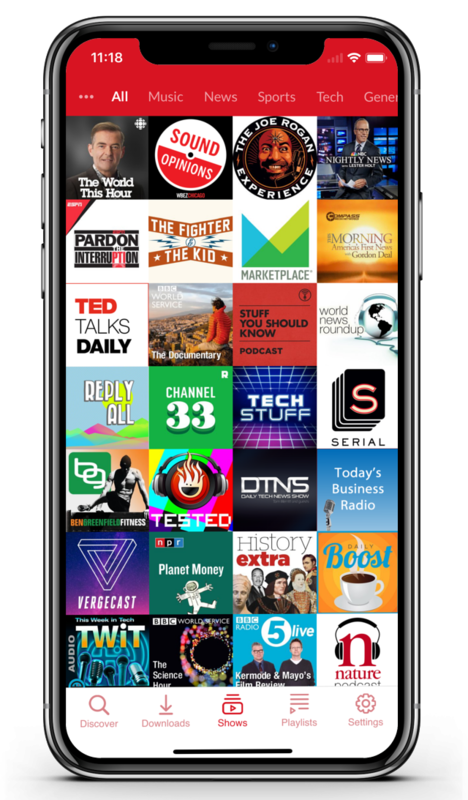 This is a podcast app. Downloads are key! 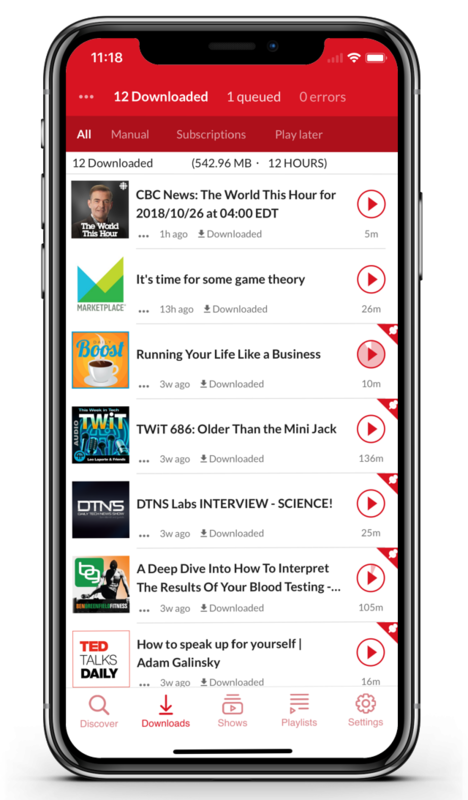 Your subscriptions and playlists will auto-download, and you can also manually download any episode, subscribed or not. You’ll be able to manage, view progress, and browse downloads in the Downloads screen. 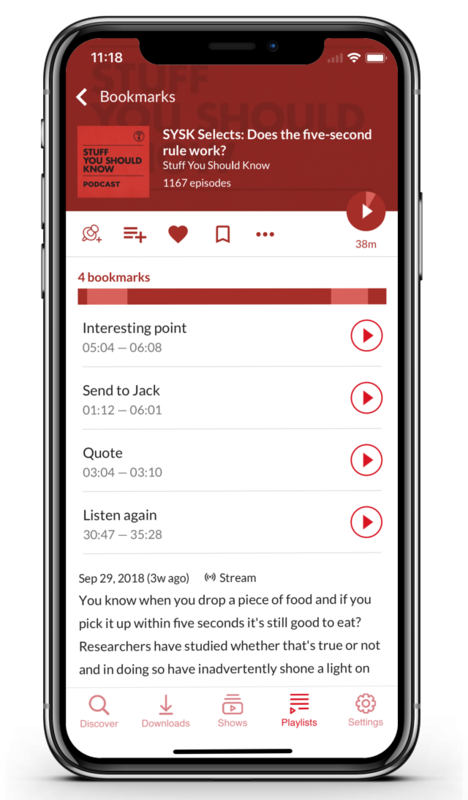 On iOS, background downloads are difficult bordering on impossible due to the OS’s battery considerations, so Player FM will download several episodes in parallel to help you get them fast. In Settings, you’ll find all the tools to setup the app how you like it, with respect to downloads, playback, notifications, and so on. Dark theme lovers will be pleased to know themes are already supported – you’ll have a choice of dark theme and also the standard app themes in different colors. 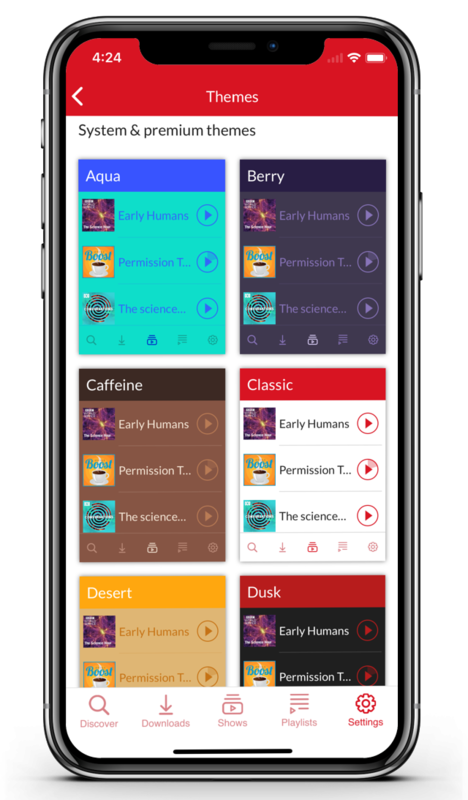 Additionally, premium users will be able to access premium themes and see their own themes synced across devices. We’ll be adding theme editing soon too.